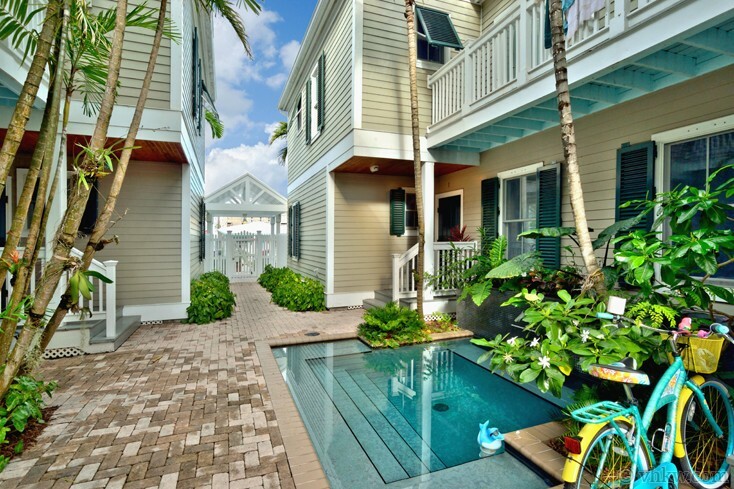 Aspirational, luxurious, well appointed, and whimsical, are four attributes that best define this Key West courtyard townhome. 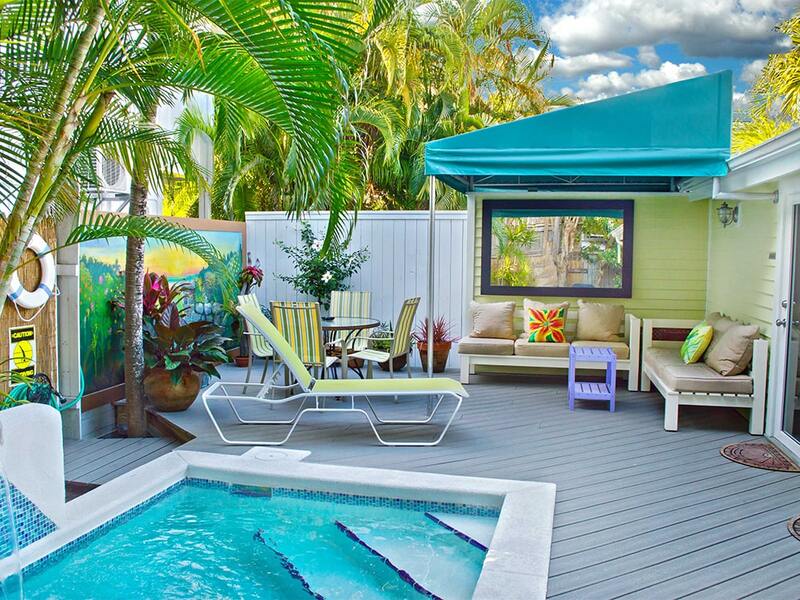 Aptly named, Island Interlude, this 2-story property is situated in one of the most popular transitional urban scenes of Key West. Here you’re literally around the corner from trendy Petronia Street, where you find fun local shops, internationally famous local restaurants like Blue Heaven and Santiago’s Bodega. You’re also just one short street from the luxury neighborhood of Truman Annex and the entrance to Fort Zachary Taylor Beach. 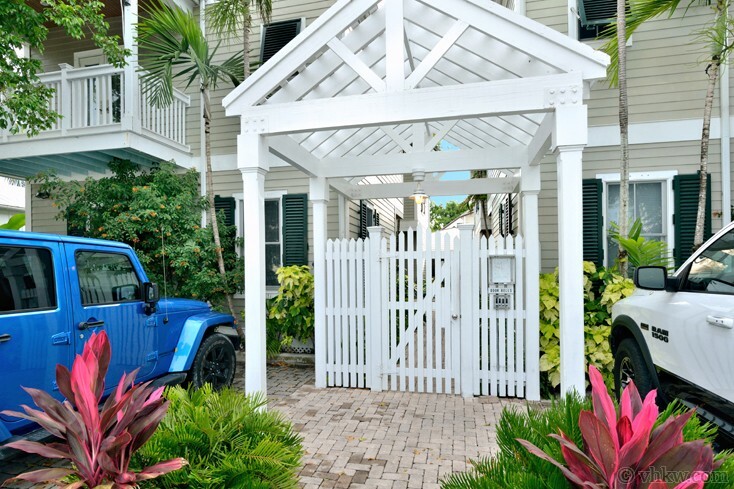 The vaulted arbor gate entrance to the courtyard sets an elegant tone for this small gated complex, and modernistically reimagines this neighborhood corner of Bahama Village. 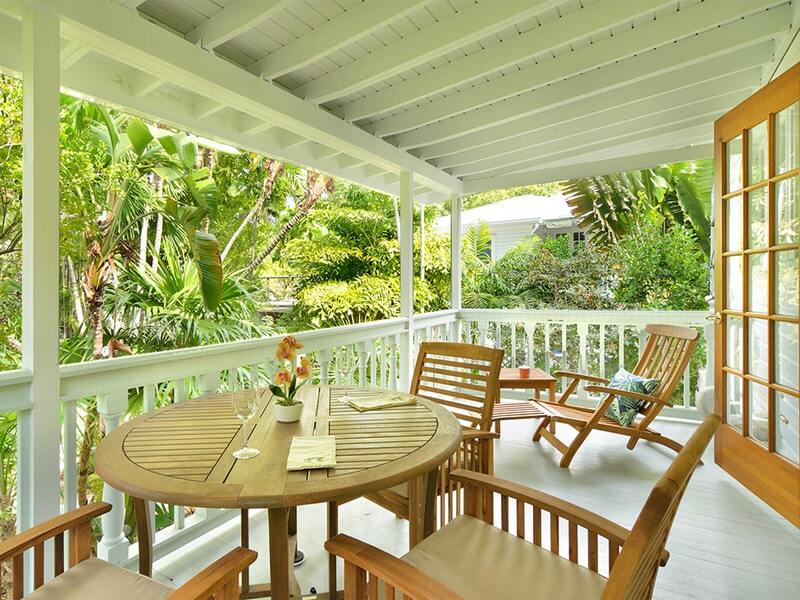 Step through the gate, and you’re immediately in a private tropical Key West scene that invites you to slow down and relax into a peaceful island pace of life. Featured in the center of the courtyard garden, is an alluring dipping pool with steps and waterfall. Graceful landscaping mixes tall skinny palm trees with flowering understory. 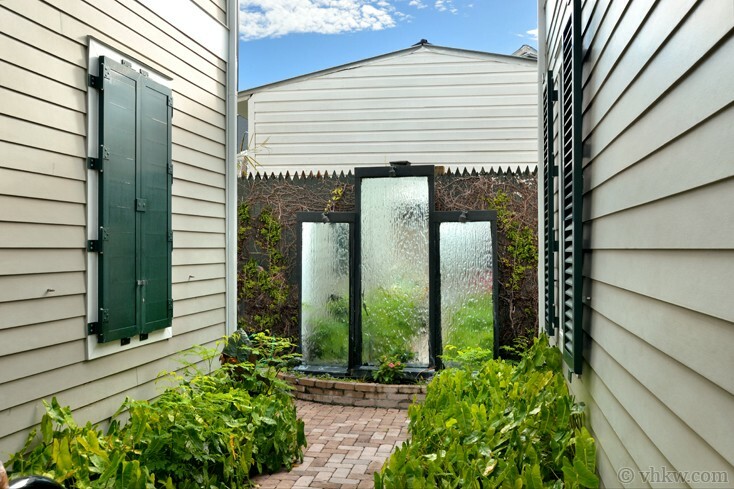 Then, at the back of the courtyard, an artistic glass wall waterfall further sets a tone that is tonic for the hurried traveler. 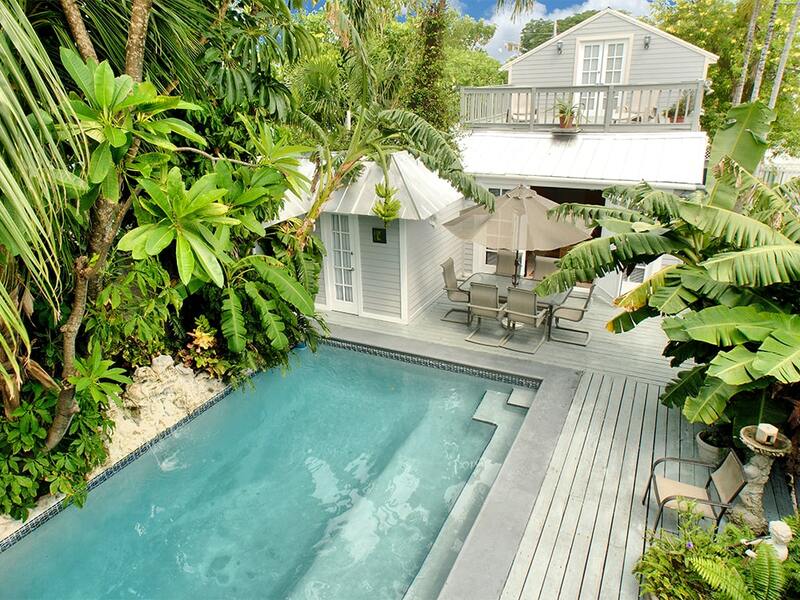 This is only one of the elements that creates the “ah” … feeling of this unique urban island property. There are only four townhomes in this exclusive complex, and this home is ideally situated toward the front of the courtyard. We now enter the front door, noting the frontline view to the pool, and it is here where we begin our tour. A four-paneled wooden door sets a traditional tone for the front entrance. But once you step into the great-room you're treated with an elevated design, that’s kicked up a notch. 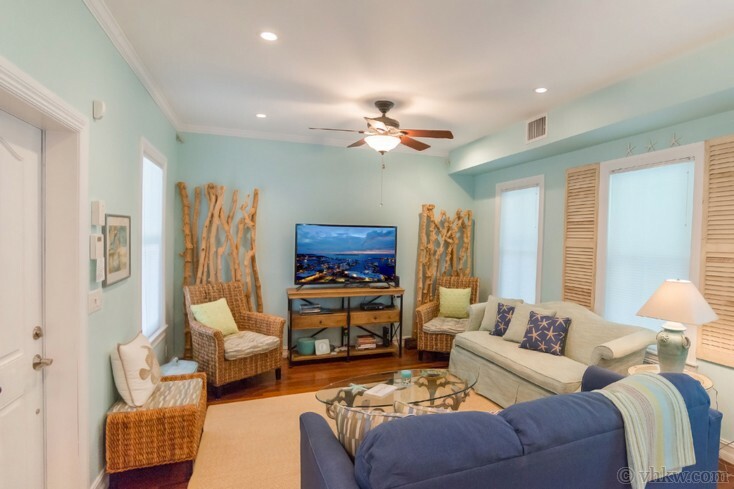 An uplifting space, filled with a collection of colorful furnishings and artful decorative pieces that are tropical-Caribbean, the room is at once tailored and playful and is sure to make you smile. A row of 3 traditional sash windows on one wall in the living room, are whimsically trimmed with bright yellow reclaimed window shutters that frame the green linen sofa. Two stylish winged-back chairs are crafted of water hyacinth, back up to a tall driftwood sculptures. The living room runs straight ahead to the kitchen that is situated at one end of the great-room. High end stainless steel appliances, granite counter tops, and hardwood cabinets give the kitchen a traditional design while at the same time making it upscale. Designed in a U-shape, it’s is a great use of space that naturally relates to the living room with an eating/serving bar and chairs. With this layout, the cook can stay in the action during meal preparation and entertaining. Fully equipped with extra features, including custom lighting, commercial style stove top, and large French door Sub-Zero refrigerator make it a pleasure for any serious cook. Gathering around the dining table for a long leisurely meal, is made a pleasure in this home, with a separate dining room adjoining the kitchen behind pocket doors. A light wood table, with matching 6 cross back chairs, make the room casual yet elegant. 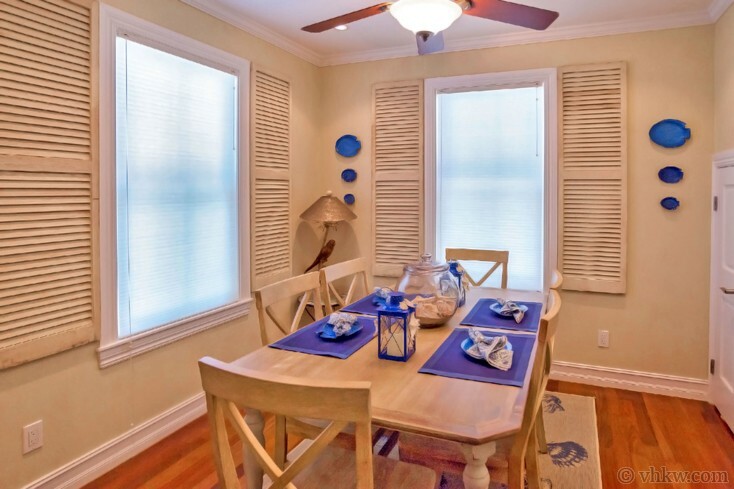 The tropical theme is carried into this room too, with reclaimed window shutters framing the windows, while fanciful cobalt blue wall ceramics keep the room sophisticated. The architects thought of everything with the added convenience of the pretty half-bath (with sink and commode), that discretely connects to the dining room. High ceilings, wide crown molding, and recessed lighting make the entire downstairs space feel expansive and bright. Planked hardwood floors create the historic Key West island look that dark wooden floors achieve. 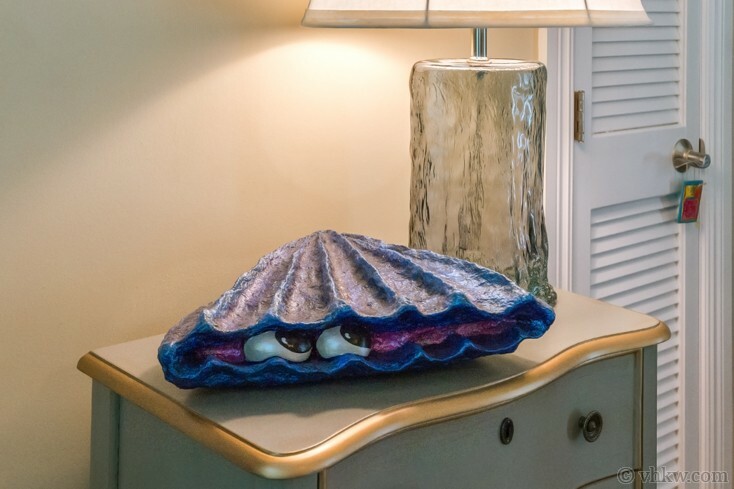 They maintain a traditional base with the reimagined décor throughout the home, including the 2nd floor. Ascend to the 2nd floor to find the bedrooms, via the switch-back staircase that is kept timeless in design with varnished wooden treads and bright white risers. 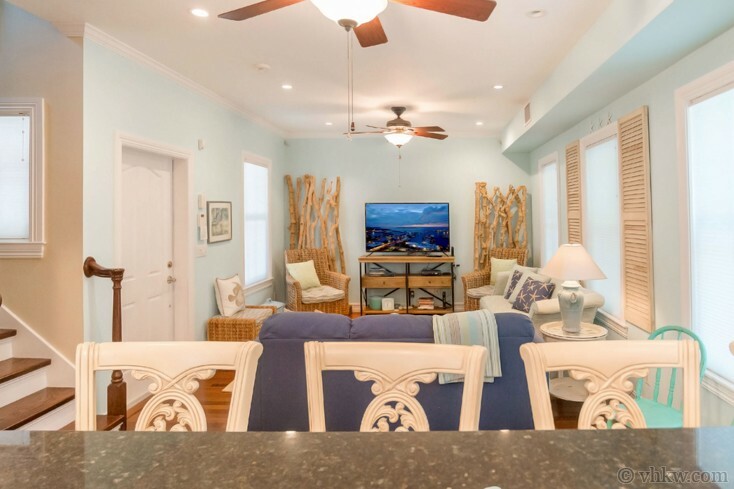 But once you reach the landing, expect to see more conversational design brought to life with soft Caribbean colors and artistic pieces. With two master bedrooms with en-suite bathrooms and queen size beds, there is no need to flip a coin to see who gets ‘the best’ bedroom. Suite one, is straight ahead from the top of the stairs. 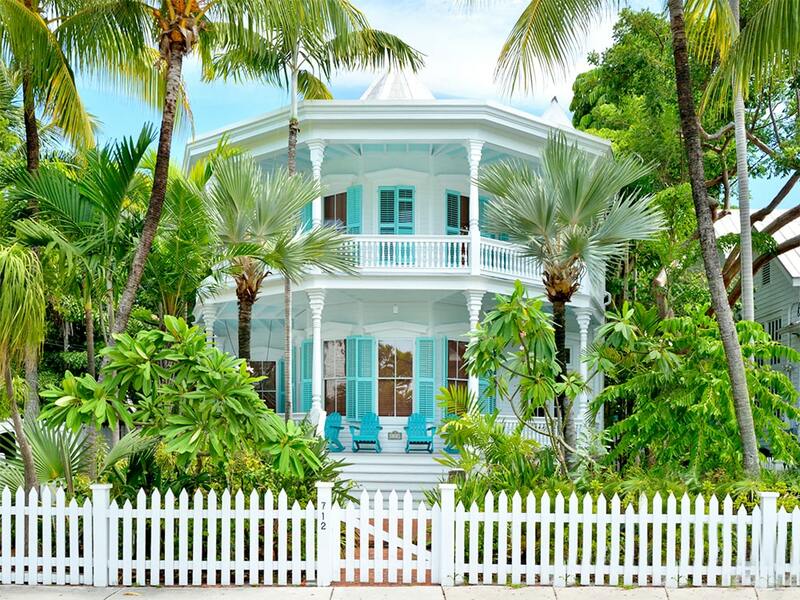 Walls are painted a tropical blue with white trim. White wooden cottage furniture is made whimsical with a creative painting. 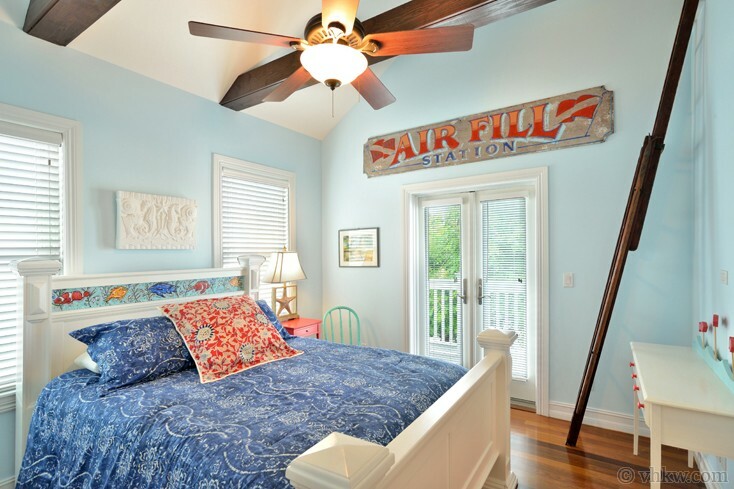 A headboard trim piece painted as a tropical fish mural, and a bedside table and chair are done in bright coral and turquoise. 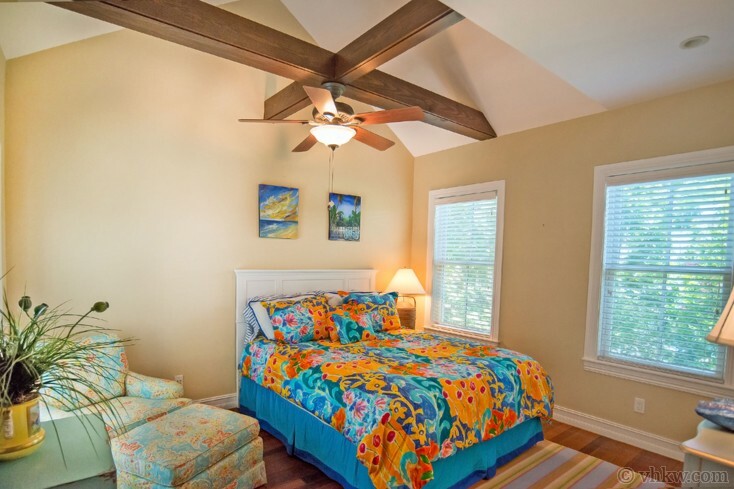 In traditional contrast, open beams ceilings are stained and varnished to match the wooden plank floors. You can see in the slide show, the double single-pane French doors that lead to a private balcony. Large enough to set a chair, it gives a nice view of the neighborhood. 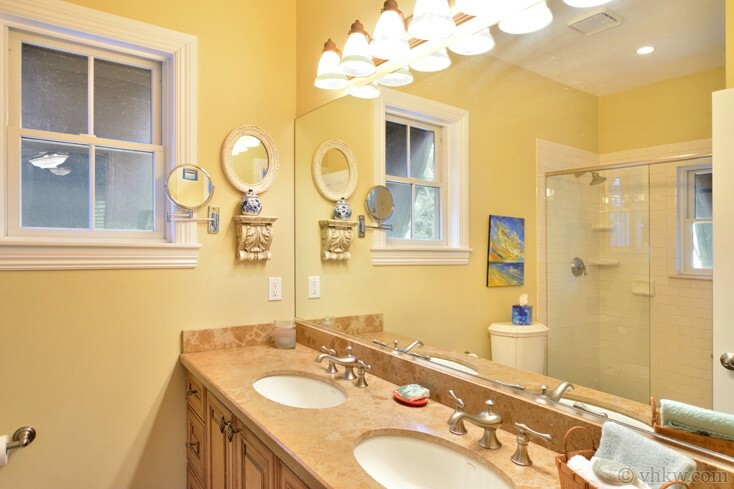 The en-suite bathroom offers an elegant wooden double sink vanity with granite counter tops, in pretty contrast to the bright yellow walls. The oversized shower is tiled in white subway tiles, and clear glass doors and designer bath fixtures complete the look. Back into the bedroom, there is a step-in closet, plenty of room for more clothes than you’ll need. Leaving this bedroom to the 2nd floor hallway, our tour heads for the second suite. But before we look, take note that there’s a conveniently placed laundry closet in the hallway, between the two bedrooms, with a stackable washer/dryer. 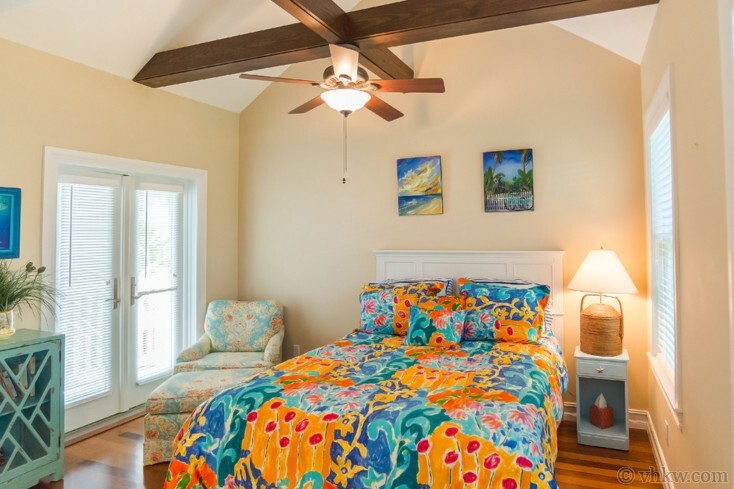 Suite two offers the same wooden open beam ceilings and planked wood floors as suite one. 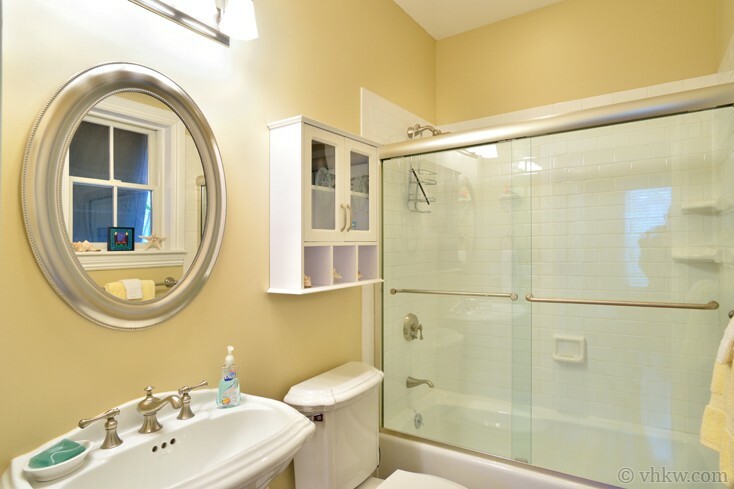 A main difference is the bathroom design which provides a bathtub with in-tub shower, and a pretty pedestal sink and round vanity mirror. Bedroom décor is made lively with walls painted sunshine yellow, in coordinated contrast with the soft tone tropical theme wall art. Accent furniture in this bedroom, is also painted bright coral and turquoise, and in our slide show, the bed is dressed in a colorful comforter that matches. Suite two also has a private balcony accessed through single pane French doors, except the view on this side is of the dipping pool and the bricked center courtyard below. 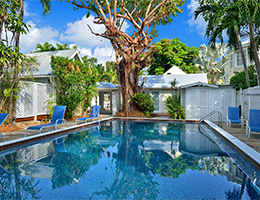 Notes on this property would not be complete without emphasizing the aspirational aspect of this small upscale courtyard complex, known as Emma Courtyard, on the edge of Bahama Village. 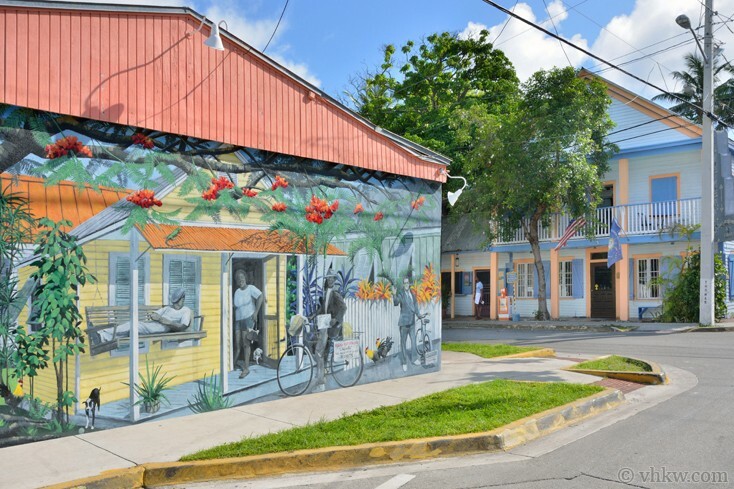 Some people call this area “the real Key West,” since it retains an authentic Caribbean feel that has been lost in some Old Town neighborhoods that have been completely gentrified. 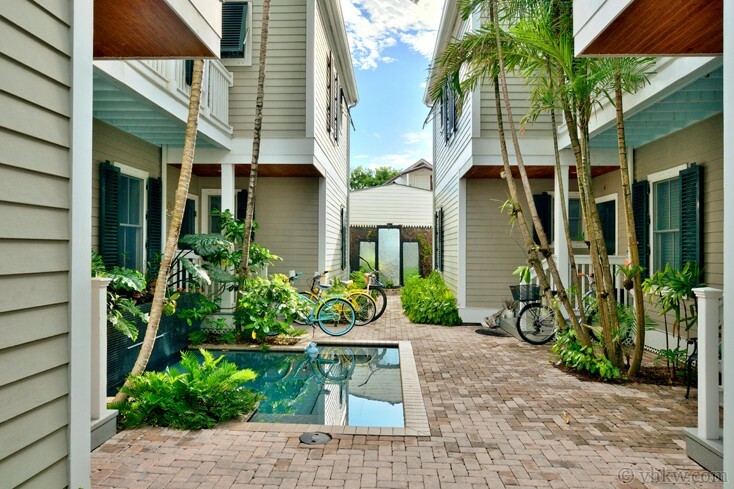 Also, with only four townhomes in the complex, the garden courtyard scene feels welcoming with just enough privacy to relax and take in the ambience of the island of Key West. 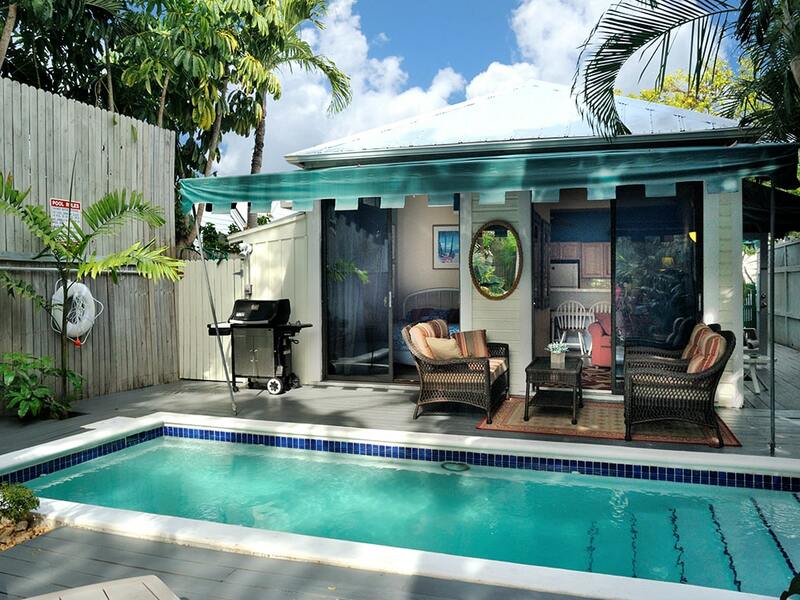 And let me not forget: this property offers even one more coveted features in Key West … private off-street parking in front of the property! The gated complex is access through a craftsman vaulted arbor gate with white picket fence. Inside the gate, common grounds include a bricked center courtyard and tropical pool garden with two water features. A shared lounge pool with waterfall is in the center of the courtyard, and a trickling wall waterfall at one end of the courtyard opposite the gated entrance. 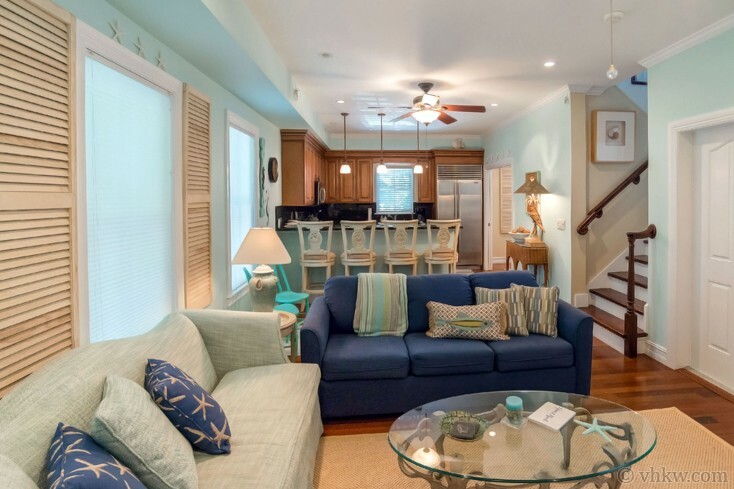 Private to this townhome, are 2nd floor sitting balconies connecting to each bedroom suite. Palm trees and landscaping in front create desirable curb appeal. Amenities: Shared garden courtyard, dipping pool with walk-in stairs and waterfall, private balcony overlooking the pool, fully fenced and gated. Gas BBQ grill. 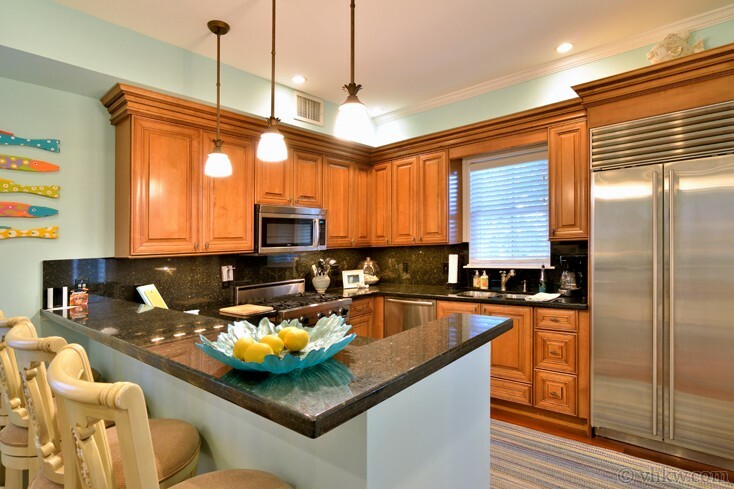 Fully equipped kitchen with top-end stainless steel appliances. Central A/C, washer / dryer, large flat screen TV’s in living room, and both suites. Linens and towels are provided. 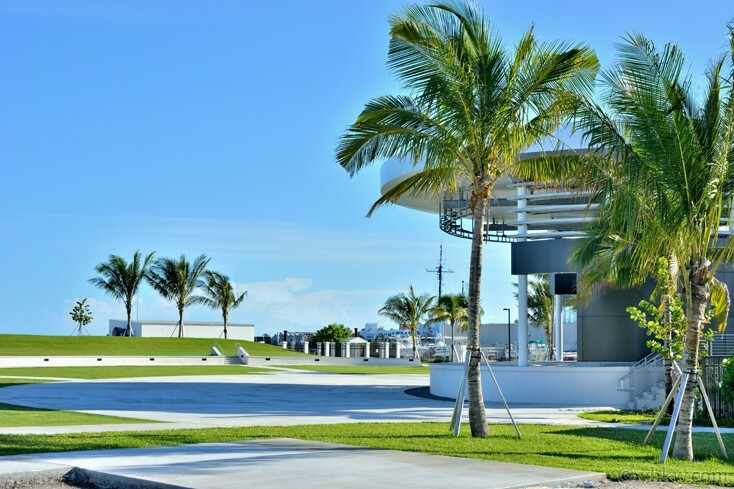 Activities: Around the corner from trendy Petronia Street, with famous restaurants including Blue Heaven and Santiago’s Bodega,and local boutique island and boho shops with Caribbean flare. 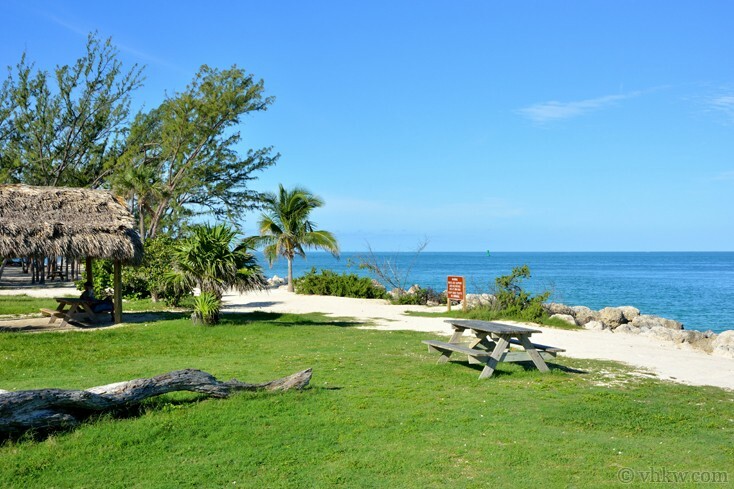 Short block from entrance to upscale Truman Annex neighborhood and Fort Zachary Taylor State Park and Beach. 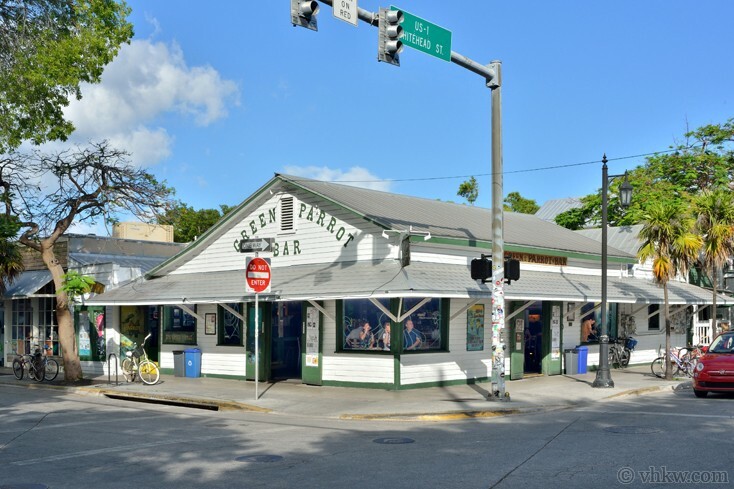 Only two streets from Mile Marker 0 and the Green Parrot Bar, the Key West Lighthouse, the Ernest Hemingway House Museum, and three streets from downtown Duval St. 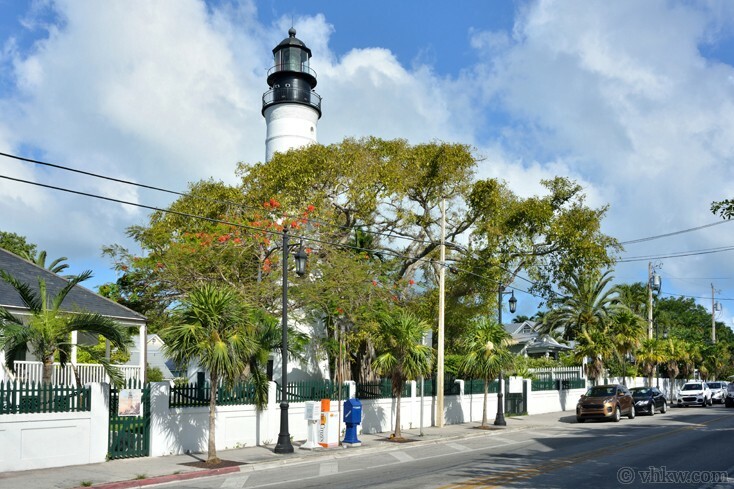 Walking distance to all Old Town Key West features including shopping, restaurants, night life, museums, sailing, boating, snorkeling, diving, beach, theatre, family activities. Everything is within walking distance. 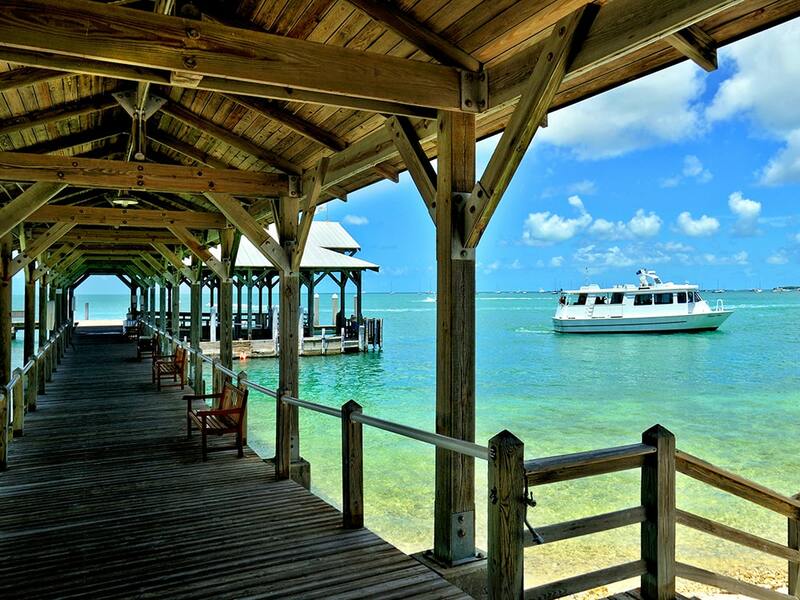 Leave your car at home, or park it when you get here and only use it to go to the grocery store or explore the Florida Keys. You can walk to the Mallory Square Sunset Celebration in 5 to 10 minutes. Area: This home is on the northwest side Bahama Village near Angela St., that intersects the Downtown Old Town and Upscale Truman Annex neighborhoods. An inevitable gentrification of this tiny district has brought aspirational new designs along with renovation and restoration to of many of the historic buildings, making way for hip and ethnic restaurants, boutique shops. Beautifully restored charming cottage style homes are on some of the streets. 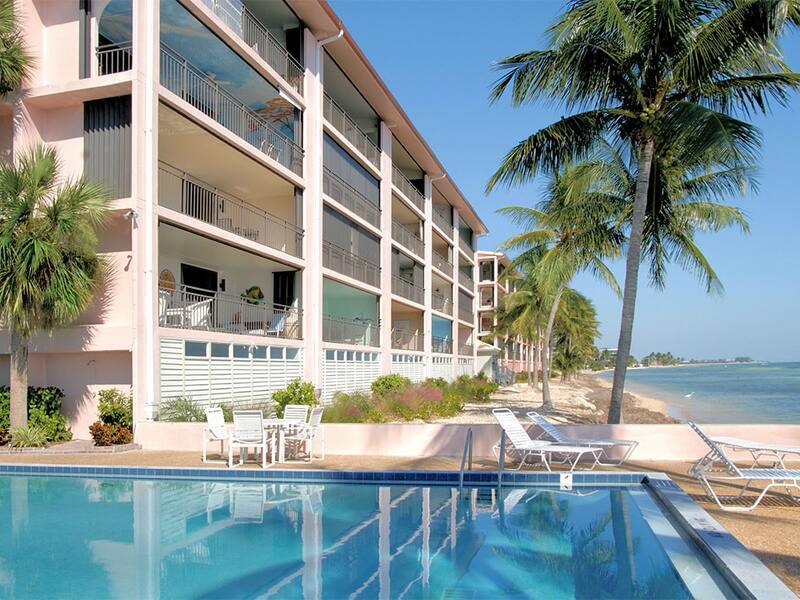 Some folks consider Bahama Village the last enclave of "the real Key West." 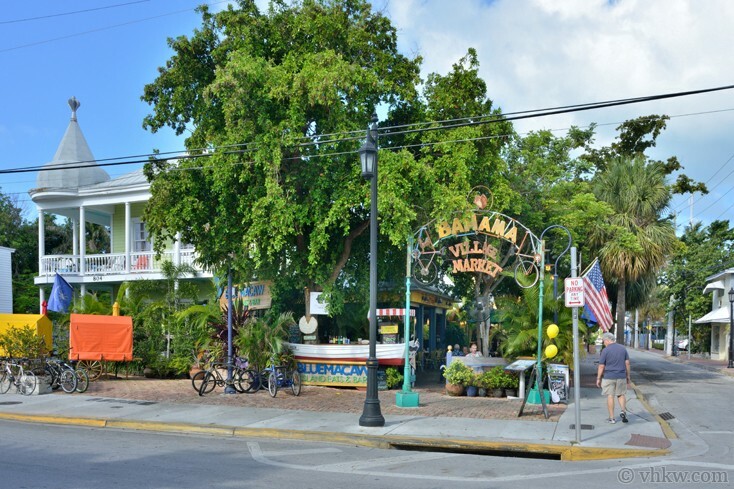 Bahama Village is a distinctly unique historic district where Bahamians moved from the Bahamas to settle in Key West in late 1800's. 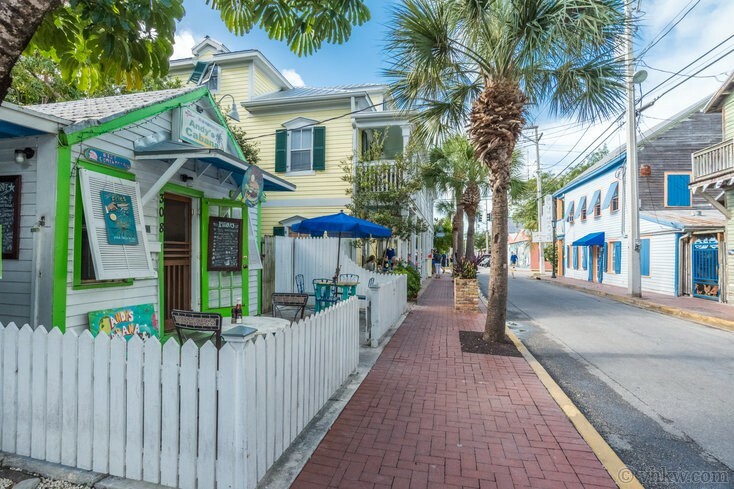 Strolling village streets is reminiscent of the Bahamas with clapboard "shot gun" houses painted white, Caribbean blue, and canary yellow. 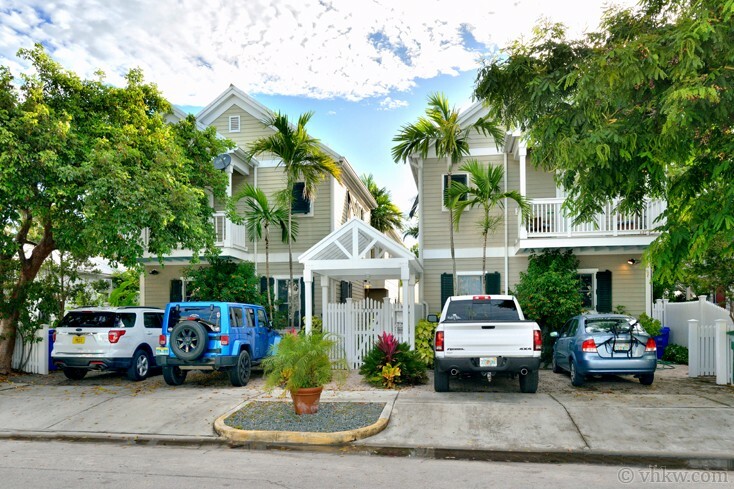 Parking: This townhouse has private off-street parking for one car, located directly in front of the property near the front entrance. However, with this central location you rarely need to get in your car. Enjoy walking or biking everywhere - you'll see more that way. Restrictions: Monthly rental. 30 Day minimum. Smoke free house. The property is in a private residential townhouse complex and is not suitable for staging loud parties. This property is not "child-proof." We do not accept guests less than 25 years of age unless accompanied by a family group or guardian.